Felicia Day is a professional actress who has appeared in numerous television shows and films, including a two-season arc on the SyFy series Eureka. She is currently recurring on The CW show Supernatural. However, Day is best known for her work in the web video world, behind and in front of the camera. She costarred in Joss Whedon’s Emmy Award-winning Internet musical, Dr. Horrible’s Sing-Along Blog. She also created and starred in the hit web series The Guild. In 2012, she launched a YouTube channel called Geek & Sundry, which was purchased by Legendary Entertainment in 2014. Day continues to act as CCO and develop web content and television projects with Legendary as a producer, writer, and performer. "You're Never Weird on the Internet is fun, hilarious, and impossible to put down. Reading it is like getting a mega-shot of courage -- to be exactly who you are and no one else, to pursue your dreams fearlessly, to embrace your weirdness and wield it like a superpower. If you want to live a life true to yourself and not what others expect of you, you won't find better inspiration than Felicia Day. If you're not one of Felicia's millions of fans yet -- you will be." 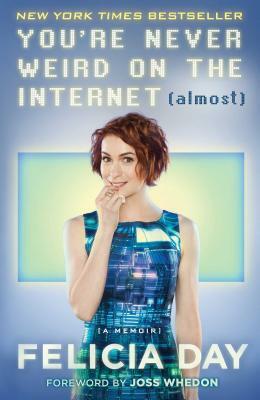 "I came for the delightful snark, I stayed for the disarming frankness and the hard-won insights about the Internet -- Felicia Day uses the Internet to distribute entertainment, but she understands that it's really there to be the nervous system of the twenty-first century."